Tired of that battery-powered screwdriver being dead when you need it most? Here's an alternative. 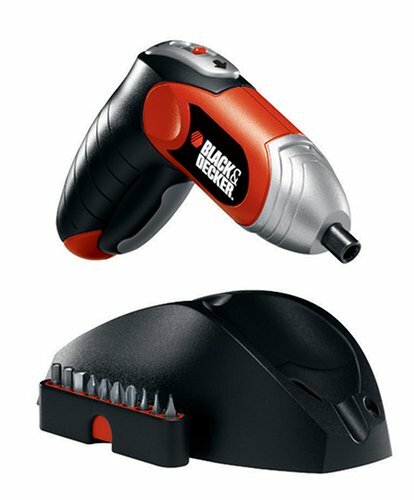 Surprisingly powerful and stunningly lightweight, Black & Decker's 3.6-Volt Cordless Screwdriver features the best energy-to-weight ratio and longest-lasting charge available. 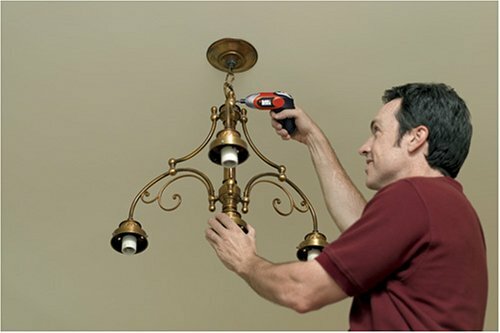 Just the right weight and style for assembling furniture, hanging curtains, and mounting light fixtures, this tool is powered by a lithium-ion battery that holds a charge up to 18 months longer than comparable nickel-cadmium-powered drivers. A very forgiving power screwdriver for those who hate cords but frequently forget to recharge, the lithium-ion battery also helps this tool deliver 20 percent more power than Ni-Cad tools. When it is time for a recharge, a fixed, internal battery lets you just drop the whole tool into the included charging base, rather than detaching it from the tool and attaching it to the charger, a process that sometimes takes longer than driving the darn screw. Half the size of most screwdrivers in its class, this tool is great for working in tight quarters and around tough corners. 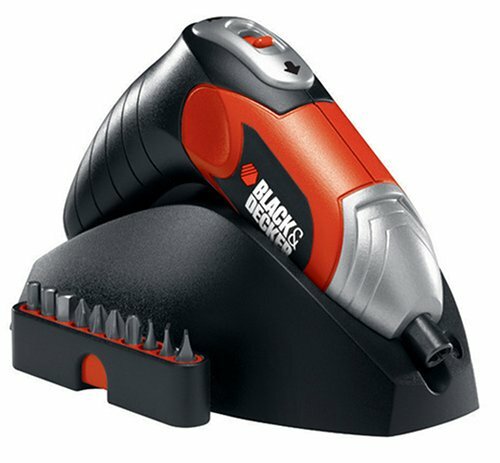 cordless screwdriver, charging base, 40 accessory bits. 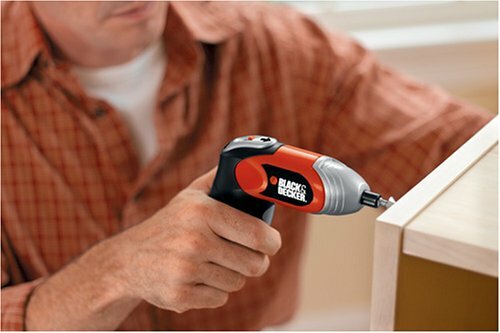 The B&D K13000 Cordless Screwdriver is a handy tool for small jobs. 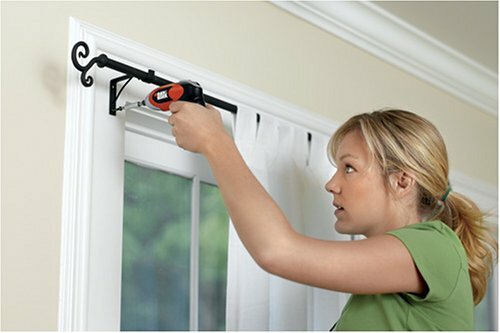 I find it does not have the power to drive or remove stubborn screws, but is really great for doing everyday jobs around the house. I had to attach a clamp on a dryer vent. In the past, tightening the screw with a screw driver while holding the clamp in place was a frustrating job and often took several attempts while the clamp slipped. With this power screwdriver the clamp went on in one attempt and quickly. How nice. I find this tool easy to use, and at this early stage of ownership I am happy with my purchase. Small but powerful enough for most household chores.Only drawback is chuck is not magnetic.Bits have a habit of falling out. Very good battery life with minimal self-discharge, decent torque for such a light unit, nice "feel," but not very high quality. The trigger switch is intermittent and requires variable effort and occasional whacking, and the charger died after a few months of very light use. Unimpressed. I expected this to be better than the usual rechargeable but it is great. The charge holds, one charge runs it for a long time, and it has excellent torque. Convenient charging stand holds tool. Auto-lock for manual use. Convenient thumb placement for direction reverse. It also has a nice compact size, which is extremely useful for accessing places that a conventional rechargeable won't fit. Mine came with a whole set of tips, about 40 of them which is great - I don't think it was in the description. I would buy another one of these in a heartbeat. This little cordless screwdriver has gotten more use in my house than any other driver I own. It is very handy. I believe everyone has used it at one time or another. This thing has enough torque to do big jobs that will surprise you. Definitely worth every penny.. This screwdriver has replaced my big and clumbsy ni-cad driver. It may not hold up to commercial use (maybe), but it's a great addition to my tool box. 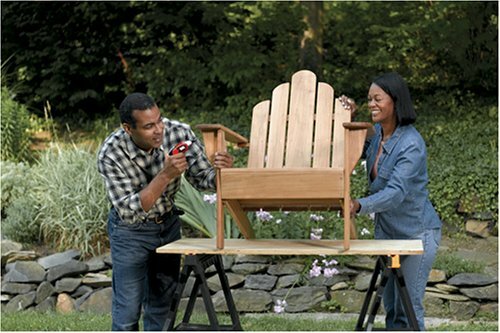 It easily handles 99.9% of the screwdriving tasks I have around the house and garage. Purchase includes entry into a $50K lottery and I'm buying a new hybrid (joke)! No joke about this tool though, it's seriously good! The LI3000 Screwdriver is a convenient shape and powerful. The charge will last well beyond six months depending on use. I bought this to give as a gift and ended up keeping for myself. Very handy - powerful and small enough to fit into tight spots. Would highly recommend. 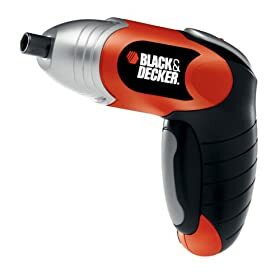 The drill is a wonderful idea because it fits my small hand and is light enough that my arthritic wrists can handle it. But it was not powerful enough to drive in screws for the first two projects I tried it on. This little drill is not worth the effort. I have an earlier B&D rechargable I use a lot but I bought this one because it was small and could get into small spaces. But when you put on the bit and adapter it is as long as my regular driver. And the bits and adapter fall out of the "chuck" easily and I've nearly lost it the few times I have used the tool. It hold a charge for along time but that doesn't count for much as I probably won't use it. I love my cordless screwdriver. I don't know why I didn't purchase one a long time ago. I have used it many times since I bought it. I work as a service tech foe a major beverage Co.I uee this tool all the time.I love it.I ues mine with a 6 inch #2 phillips. This is a great little product. Its light weight and last a long time. I used to have an old Ni-Cad powered screwdriver. It was big and bulky and the charge didn't last very long at all. My wife even thinks this one is easy to use.